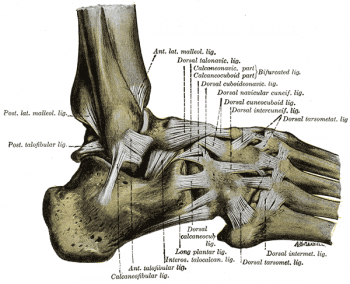 To examine the ankle for injury of the Anterior Talofibular ligament and the Calcaneofibular ligament. The anterior drawer sign cannot replace the talar tilt examination, or vice versa. The two methods are complementary. It is not possible to differentiate between an isolated lesion of the anterior talofibular ligament and a combined lesion of the anterior talofibular and the calcaneofibular ligaments by the two methods. The reliability of the radiographic talar tilt test was evaluated using MRI in 112 athletes with injuries to the lateral ligaments of the ankle. Twenty-five athletes with a talar tilt of 15" were treated operatively. lntraoperative findings and the talar tilt test were compared with MR imaging results. The results suggested that MRI is a reliable method for diagnosing injuries of the lateral ankle ligaments. The talar tilt test cannot evaluate the specific pathology of lateral ankle ligaments, but it was reliable in indicating complete double-ligament ruptures (anterior talofibular and calcaneo-fibular ligaments), when talar tilt was 15" or more than on the uninjured side. Sensitivity 67, Specificity 75, LR+ 2.7, LR- 0.44. ↑ Cook CE and Hegedus EJ. Orthopedic Physical Examination Tests: An Evidence-Based Approach. Prentice Hall. New Jersey. 2007. ↑ Johannsen, A. 1978. Acta Orthopaedica. Radiological diagnosis of lateral ligament lesion of the ankle: a comparison between talar tilt and anterior drawer sign. ↑ Hertel et al. Extracted from Orthopedic Physical Examination Tests: An Evidence-Based Approach: "Medial Talar Tilt Stress Test."